It is ironic that as the project was taking place BTN suffered first-hand experience of one such danger that seems to have escaped notice. We are talking about the situation caused by the lack of jetways or airbridges when loading an aircraft with passengers. Their lack is one element; refusal by some airlines to sign up to their use is another. “We were held in the holding lounge for 15min with a diesel bus outside churning out fumes as it waited to take us to the aircraft. Some elderly people secured a seat. Not all. Next we were driven perhaps 50yd to an aircraft sitting by an airbridge and deposited on to the apron with everybody, including children and the less able, standing around. After about 5min, those for the rear door of the aircraft were marched away. Steps were used to enter the aircraft. Fortunately, it was not raining. At the other end, everybody, complete with lots of hand baggage, had to climb down the steps of the bus on to the tarmac and then up more steps to the airbridge building. BTN is told airports charge the same whether steps or airbridges are used. On the return leg there were no staff between the bottom of the steps and, this time, the entrance to the building. Not a safe process. What has brought the problem to a head is the growing numbers of passengers that can be fitted into a modern aircraft. Taking Airbus as an example, capacity has grown from 150 seats on an A319 to 180 seats on an A320 and to 235 seats on an A321, a rise in passengers per aircraft of more than 50%. Should the CAA look into this problem, Luton would have to rethink. It has no airbridges. There would have to be dispensation for, say, airports with fewer than 5m passengers. BA is said to be looking at the passenger loading experience, perhaps another way of ‘dumbing down’. • In more bad news for those who fly, the PA Consulting Group also chipped in on Safety Week by releasing its latest research finding, indicating airports are ill-equipped to deal with a major cyber-attack. The report, Overcome the Silent Threat, says the emergence of a hyper-connected model – where passengers in airports want fast internet and digital engagement with airlines and retailers – is increasing the opportunities for cyber criminals to exploit. 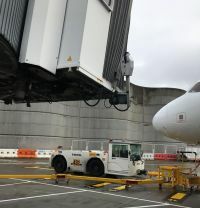 There are currently around 1,000 cyber-attacks each month on airport and aviation systems worldwide, according to the European Aviation Safety Agency. According to PA's research, airports are at a higher risk of cyber-attack due to increasing use of technologies and digital infrastructure in day-to-day operations, new data-sharing obligations and greater connectivity across staff and passenger devices within airports. PA Consulting Group global transport security lead David Oliver said: “Fundamentally, the focus on physical security needs to be applied with the same rigour in the cyber arena if airports are going to build resilience to potentially catastrophic cyber-attacks. We recently had a similar problem at Ft. Lauderdale Airport when on a Norwegian Flight arriving from LGW. After waiting on the aircraft for an additional 30 to 45 minutes we had to clamber down steps from the plane on to a bus. There were airbridges available, but not for us. It was a horrible experience. I am 79 and my husband is 81. This is not something we should have to experience anymore, after an 8 hour flight from London. Of course we both had hand luggage that had to be carried down the steps and on to the bus. No seats were available for us on the bus. Norwegian blamed FLL and Broward County. Not sure who was to blame. Another safety issue is that, having queued for half an hour to get your boarding passes checked, you have to queue again to get into the gate lounge (usually with a grossly inadequate supply of seats). And sometimes the queue is on a staircase. This I regard as an unsafe practice - especially considering the amount of hand baggage people take with them these days. How far does cost cutting go before it is a safety hazard?